Bathrooms are perhaps one of the most used rooms in any house, which means that after a while you get too used to it and that you will need some change. Renovating, or remodeling your bathroom can be an easy task, if you know what you want, and how you want it; but if you have yet to figure out your new bathroom look, then it can take a while to complete it. Updating a dull bathroom can be a project for the whole family, and it does not have to be done in one go, as you can simply divide it into smaller projects. The biggest issue any bathroom faces is the question of storage, and it is vital that you find a way to better organize your bathroom as it will look better and you will feel amazing. Installing stylish bathroom storage is a great way to spice up your bathroom, and to make it more welcoming for whoever is coming in. Remember to utilize your bathroom space to the fullest, so that you can have an efficient and well-designed bathroom that you will love. Check out this page for inspiration. Interior lighting is important for any room; and for bathrooms it is extremely crucial. With proper bathroom lighting, you can not only set the appropriate mood and atmosphere, but you can also make your bathroom seem bigger. However, if you are using your bathroom for more than just taking a quick shower, then you will need to put in some more thought into how you will adjust your lighting; it plays a crucial part in setting the mood so that you can enjoy yourself to the fullest. Remember that by installing layers of lights, you can create a more harmonious lighting plan that will help you start your day with a smile. After all, your bathroom is where you usually start your day. Although remodeling your bathroom with tiles means that you should consider reshaping the whole room, it does not necessarily has to be so. You can just focus on cleaning your tiles and replacing the ones which are cracked, say Sydney-based experts for bathroom renovations. Moreover, it is important maintain your tiles properly so that they can look fresher and greater for a longer period of time; after all, replacing tiles means that you will have to destroy part of your bathroom. Applying new coats to protect elements in your bathroom is important as it will make your bathroom look nicer and more welcoming for ages to come. Furthermore, it is important not only to remodel your bathroom so that it gets an upgrade, you need to make sure that you are paying enough attention to how everything is holding up. Whether you are replacing only some parts in your bathroom, or if you are focusing on expansion, it is important to think about the interior design. 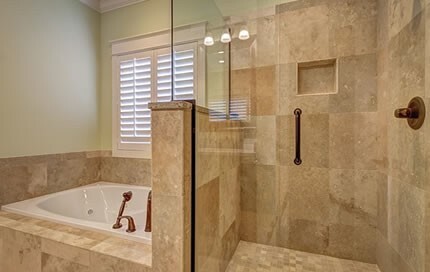 Your overall bathroom appeal should be warm and welcoming, but also relaxing so that you can enjoy yourself every time you take come into your bathroom.